I love making fancy dangle earrings, and I love making elaborate necklaces. What I don't like are the two of them together. They fight for attention as far as I'm concerned. Yes, I know that some people love to pile it on, but I'm more of a minimalist. 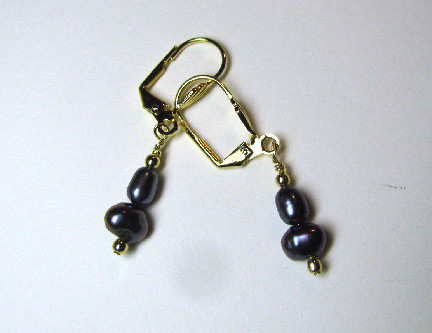 Here is an example of a really simply pair of earrings that I just made to accompany a bead embroidered necklace. This necklace isn't my fanciest, but it draws attention, so my customer agreed that I should keep the earrings really simple, with a gold tone, and by the way, she likes leverbacks! Check out my post on how to make a wrapped loop...that's pretty much all you need to know for making these. 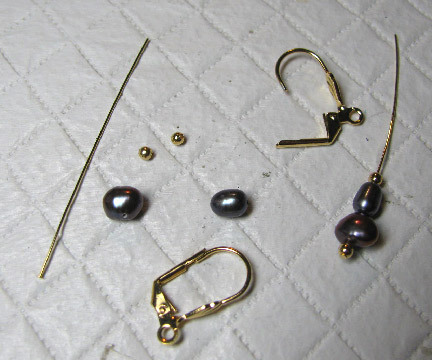 The head pins are extremely thin in order to fit through the drilled pearls. 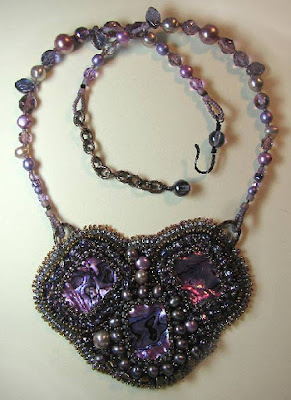 And here is a tutorial on the necklace itself. Your beaded necklaces are so beautiful and the simple earrings go so well with this one! Thank you, Jackie...I appreciate that! The earrings are just the right complement for your gorgeous bead embroidered necklace.